When Gen. Zachary Taylor’s Army arrived at the southern tip of Texas in 1846 shortly before the outbreak of the Mexican War, it took Old Rough and Ready two weeks or more to get his orders from Washington. In 1915, only 69 years later, the U.S. military had plans to install at Point Isabel a state-of-the-art radio facility that would provide virtually instantaneous communication as the government prepared for the possibility of a second war with Mexico. While territorial expansion may have been a major factor in the 1846-48 conflict, incursions into Texas by armed insurgents during the bloody Mexican Revolution would be the triggering event if war came again. 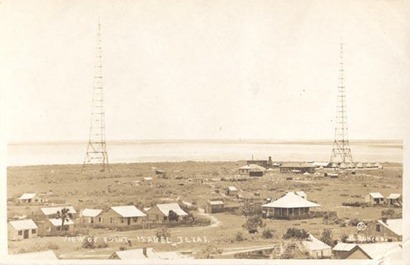 Readers of the Brownsville Herald learned on April 26, 1915 that the Navy had issued a call for sealed bids from contractors willing to build two 300-foot radio towers at Point Isabel (the community later dropped “Point” and renamed itself Port Isabel). The Navy had first installed wireless equipment in some of its vessels in 1903. Within a decade, most of the U.S. fleet had been equipped for “aerial communication” as radio was then sometimes referred to. The Navy also had 48 radio stations scattered across the globe. In the fall of 1912, government engineers selected Point Isabel as the site for yet another. When completed, the wireless installation at the remote fishing village would allow the Navy to communicate with its ships in the Gulf of Mexico, and via relay to other Naval radio stations and warships around the world. The station also would provide coast-to-coast communication as well as direct contact with the government’s primary radio station at Arlington, Va. In addition, the Texas station would be the prime relay to the newly opened and vital Panama Canal. Once in operation, the facility would transmit the dots and dashes of Morse code (though the Navy encrypted its messages) to receivers which picked up the signals on giant antennas like the one the Navy Department planned for Point Isabel. Until the Naval facility could go on the air, the government installed a less-powerful wireless station at Fort Brown in 1914. Including the cost of 22 acres, a tract which was purchased from Valley political boss James B. Wells (for whom Jim Wells County would eventually be named) and Point Isabel pioneer Charles Champion, who ran the town’s only store, the installation would cost about $100,000. An estimated 15 Naval personnel would be stationed there, the newspaper said. With a war with Mexico looking more and more likely, work on the giant antennas and other infrastructure continued 10 hours a day and would have gone on around the clock if electric power had been available to provide lighting. When the station finally went on the air, sandbags and machine gun nests protected it from possible attack. Soon, a contingent of National Guard troops from New York arrived to augment security. Point Isabel Wireless. Photo courtesy Steve Hathcock , Beachcomber's Museum, South Padre Island, Texas. Despite the Brownsville newspaper’s optimism that a Naval presence in Point Isabel would lead to its transformation, five years after the radio station’s construction, the village slumbered on. The Navy never expanded its presence at the point, no war with Mexico transpired and after the first world war, Naval activity in the Gulf declined considerably. Even so, the station still played a strategic role in its link to the Panama Canal. Harding’s visit generated considerable news media attention, and Valley residents again believed Point Isabel would boom. While prosperity continued to elude the village, the Naval radio station played a vital role in military communication and civilian maritime interests. Twice daily, it and other U.S. Naval facilities broadcast the correct time. The station also broadcast weather information, including storm warnings. The government found a buyer for the radio towers, the facility’s buildings and the land that locals had come to call the Reservation. For a time during World War II, when Nazi submarines lurked within sight of the Port Isabel lighthouse, the military again operated a top-secret radio station at the still-sleepy town, but it went off the air even before the end of the war. Three former Naval barracks, long since converted to private housing, still stand at the site. A brick structure believed to have been the station’s water plant also remains, but except for an exhibit in Port Isabel’s museum, the once important communication facility has pretty much been forgotten.